My latest In Season Report for New Covent Garden Flower Market in London is live. And it’s so lovely to see so many spring flowers popping up on the traders’ stands. For example, this dainty Muscari. As a child, I fondly remember it growing in our garden. You’ll also find tulips in virtually every colour under the rainbow at Nine Elms. Plus Hellebores, Anemones, Ranunculus and Narcissi too. It goes without saying that with Valentine’s Day just a week from today, there’s an abundance of red roses at the Flower Market. Choose from Red Naomi, which is pipped to be this year’s favourite again, Explorer and Black Baccara…to name but a few. …are in order. New Covent Garden Market has won UK’s Best Wholesale Market at the Great British Market Awards 2019 for the third time in 10 years! To find out more, simply head over to the Market website. 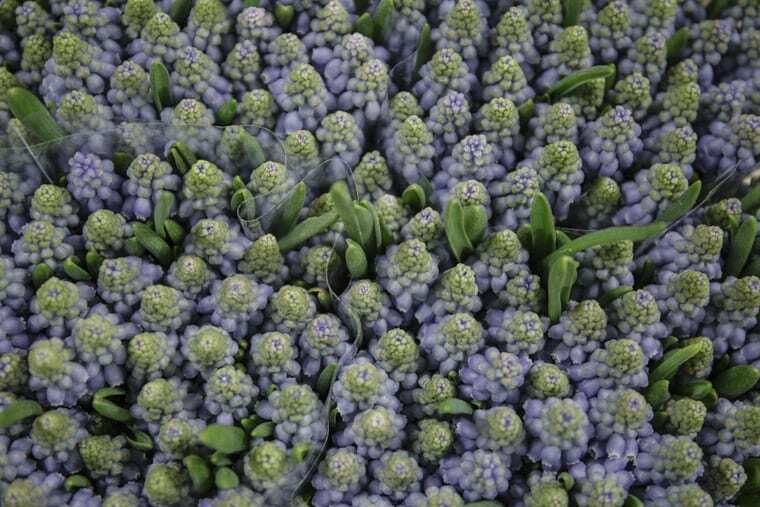 I hope you enjoy reading my latest report, In Season at the Flower Market this February. And that it gives you lots of inspiration, whether you’re seeking flowers, foliage, plants or sundries. P.S. If you missed it last month, you may like to take a read of The Hottest Floral Trends for 2019.